Of course I just have enough time before my DAY ends to get this all posted up.. I meant to do it earlier in the day.. But.. You know how fun, busy days can be! 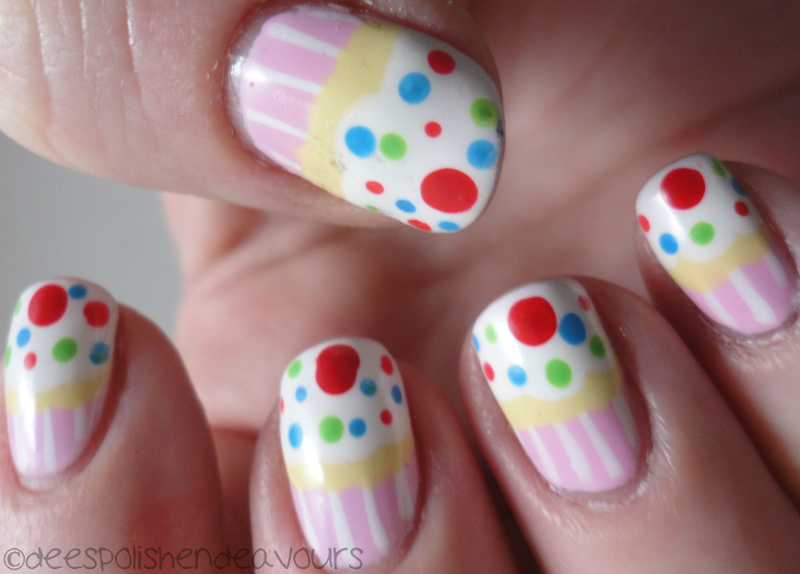 I knew for my actual birthday nails, I wanted cupcake nails.. And I randomly stumbled across this tutorial, so I went with that - and I love it! For these bad boys, I used: Daisy Nail Lacquer Pink Sachet, Orly White Out, Joe Butter, Essie Silken Cord, China Glaze Make Some Noise, China Glaze Entourage, and OPI No Room For The Blues. I got to spend my day with my siblings.. And it was so much fun! The weather was fairly nice - but extremely windy.. So we took advantage of that! We went mini golfing.. then to Ruckers.. And it was just really great! Then it was home time to enjoy family supper, amazing cake, and a few episodes of 'Sons of Anarchy'. Now I am going to show you some of the gifts I received.. From my family, of course.. I love that they all seem to know exactly what to get for me! My siblings (ok, my brother with help from my sister) got my the amazing neon yellow flats that I have been ogling from Aldo - I thought the extreme neon colour would make me look even more pale than I already am.. Totally doesn't! I love them! Then my sister knew I loved and badly wanted this Christian Dior perfume. I actually really wanted Hypnotic Poison, but in the store she wasn't entirely sure, so she grabbed this one instead. Not going to lie: I love it! 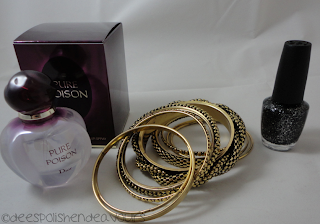 It stayed with me all throughout our adventurous day - she actually did a good thing in buying the "wrong" perfume.. Though I wouldn't say it is wrong anyways. She also bought me this set of bangles because she knows I love them for one, and two, they sort of have a reptile/snake-like air to them - love! AND a bottle of nail polish. We were in Chatters a couple weeks ago, and I had never seen this colour (OPI Metallic 4 Life) swatched.. I wanted it, but had already paid for my other purchases.. Plus I have so many bottles of polish anyways.. Well, she remembered that I liked it. Such a smart girl! 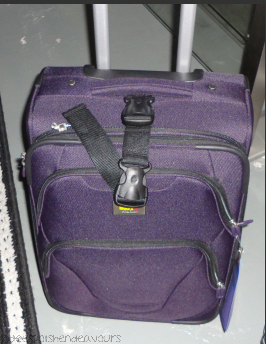 Then my ma bought me my first "real" piece of luggage. My sister and I went on a mini-trip a few months ago for work, and we took the bus to get to this other city. EVERY person on that bus had rolling luggage, except for us - we had the classic duffel bags. We plan on doing some further distance traveling in the next year and a half.. This will definitely help with that. Plus it is a lovely eggplant purple colour - I love it! Ooh, and the lining has a maple leaf pattern.. And there is a maple leaf embossed on the side as well. So good! Hah! Posting before midnight my time.. This still counts as my birthday post.. I hope everyone enjoyed April 4th as much as I did!! Happy birthday! Hope you had a great day. Loving the mani. So cute! Happy Birthday love the cupcakes!! Very cute mani, happy birthday!! Eee I saw those shoes at Aldo and I wanted them so bad! Lucky you! Oooooh how cute! Happy Belated Birthday!!! This looks cute, you have lovely nails!